I found the site to be very overwhelming with way too much information scattered all over it. Though the site has very clear navigation and labeling, I still feel as though it is quite difficult to actually focus on one particular topic, and it is frustrating to me that the content is frequently presented in chunked subsections that contain numerous additional hyperlinks and bullet points. Essentially, the site feels like an endless choose-your-own-adventure book without a clear goal or end in sight. Additionally, I am very turned off by the many instances of sponsor logos and sponsor lists found on resource pages (Apple, Cisco, Pearson, Adobe, Crayola, Intel, Walt Disney, etc.). This makes me feel skeptical about the website and its aims. I have to wonder how much profit is being generated for the numerous private companies listed on the site and whether or not they actually believe in 21st Century Skills or if they see this as a trend by which to capitalize on public education. Nothing on the site particularly surprised me. I found most of it to be quite familiar already (thanks, in part, to my school district's aggressive efforts to incorporate 21st Century Skills and technology into our professional development, curriculum and school environment). I would have really liked to see my state's data on the Overview of State Work page, but could not get New Jersey to load in Chrome, Firefox or Internet Explorer. Perhaps I wasn't meant to click on the blue states at all, but the design somewhat gives the impression that the user should be able to find state-specific information that way. In any case, I was disappointed with that page. The Common Core Toolkit seemed like it could have been promising, but only offered specific suggestions for math and English. To be honest, it seemed more like one of the catalogs we find in the teachers' room sitting on the lunch table than an actual resource, as there was much more of a focus on links to textbook distributors and for-profit educational technology companies than actual pedagogical content. Fundamentally, I disagree that public education initiatives and reform should ever be driven by and/or intermingled with for-profit products or services. I feel that education initiatives and reform should be data-driven and that teachers and educators with a lot of classroom experience should have a large role in leading that kind of progress. If companies like Pearson or Scholastic or Houghton Mifflin want to help, I don't have a problem with that; however, I do not think that the initiatives/reform can remain untainted or objective once money/profit is involved. To me, this website makes it appear as though money and profit are hopelessly intermingled with the aim to bring 21st Century Skills to our students. Despite my criticism of the corporate involvement in this particular organization, I do not actually disagree with implementing 21st Century Skills into our classrooms and school communities. On the contrary, I am quite excited by the idea and have already found some success when using guided inquiry methods and collaborative technological resources in my courses. Part of my job in my own district is to coach my colleagues on how and why to begin to include diversified assessment, information literacy, collaborative projects and other modern skills into the curriculum. I believe in what I do and enjoy assisting my colleagues and the students in my district to achieve these goals. I do feel that our students will be better prepared for life if they have more exposure to and practice with collaborative tasks, leadership roles, interpersonal activities, self-direction, ethics and other 21st Century Skills. However, I also agree with Levy and Murnane (2006) that attention needs to be given to those students pursuing a vocational or technical education in hopes of attaining a "blue collar" job such as carpentry, electrical contracting, plumbing, auto repair, etc., jobs that will continue to grow due to the "expert thinking" required of those performing these tasks. I do not feel that the P21 organization is really addressing that particular subset of students with their website. I also do not feel, as I have said in numerous other ways, that the site itself is particularly useful or helpful due to its poor design, distracting tendency to focus on corporate logos and sponsor links, and the organization's ties to for-profit companies. Levy, F., & Murnane, R. (2006). Why the changing American economy calls for twenty-first century learning: Answers to educators' questions. New Directions for Youth Development, 2006(110), 53–62. Your frustrations with the P21 website were the same as my own, that being a large volume of information, very repetitive and little facts about actual implementation. Grand ideas, but no action...such a common theme in the field of education. I try to not be cynical about new trends in education, and I definitely believe there is a need for updating our current approach to education, however, I could not get a strong sense of this organization truly being on the cutting edge of helping this to happen. Which brings me to Internet Literacy, a skill we need to be teaching our students. When exploring a new website I often find myself questioning my own literacy skills, and technology skills for that matter, so how do I teach that to my students? It feels troubling, trying times being in the midst of education these days with many topics being debated, and as an educator not being sure where to focus or resources and energy. The good news is in a few short weeks we will return to the classroom and have the opportunity to explore new ideas with our students, and it is that opportunity to share our passions that brought us here in the first place. Julie, I am so glad you commented. Obviously we are very much on the same page with the P21 site. I love that you pointed out that information literacy naturally comes up in this situation; we do need to know how to tell a great website from a horrible one and be able to easily point to characteristics to support those judgments. I am cynical by nature about pretty much everything, but I do believe in teaching 21st Century Skills--in appropriate, meaningful ways that actually help my students. I also do not believe in technology and 21st Century Skills being the ONLY way in which we should teach our students; I am of the mindset that a blended technique is always going to be most useful in a mixed group of personalities and ability levels. Maybe you feel similarly regarding that topic, too? How interesting that you noted the sponsorship notices, I didn't notice them at all. I think there can be positives and negatives of having corporate support for educational initiatives. If there are too many stings attached to the support, it can be difficult to actually carry out good educational practice if it is counter to the desires of the sponsors. However, if the corporate sponsors are willing to step back and let educators do what they think is best, it can be a good partnership, especially when there is little support for education in many parts of the nation. Setting up PBL can lead to collaboration and cooperation to complete tasks. 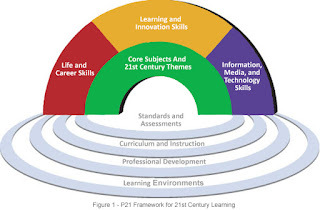 I didn't see any support for it on the website, but there is a great website http://www.bie.org/ that has lots of support for PBL with plenty of resources to initiate and support it. Hi Mary. I couldn't miss the corporate sponsorship! I felt like it was all over the place to the point where it impeded my ability to see actual content at times! It has definitely been interesting to read everyone's reactions to the site. You need Chrome profiles. You do. Ed Tech: Caffeinated is licensed under a Creative Commons Attribution-NonCommercial-NoDerivs 3.0 United States License.